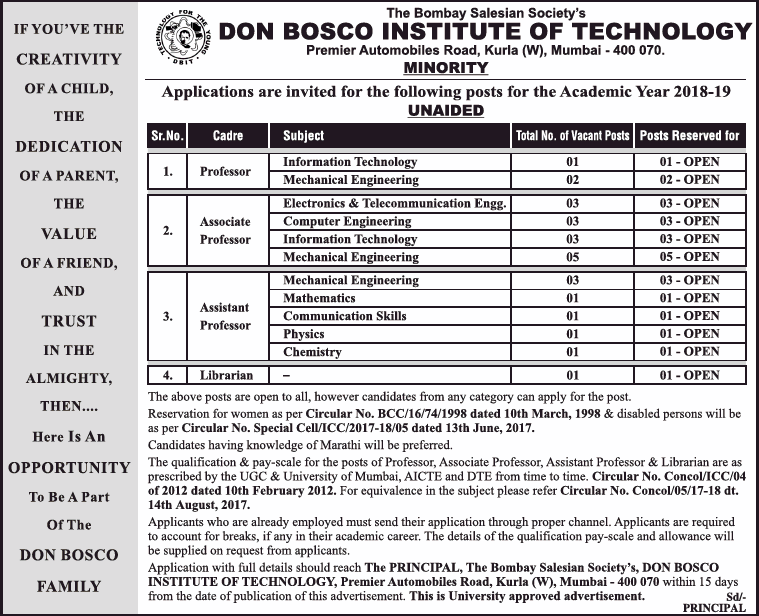 Don Bosco Institute of Technology (Don Bosco Institute of Technology Mumbai), Mumbai Published Job Notification for 25 Professor – Assistant Professor & More Posts. Candidates who wish to apply must look at Don Bosco Institute of Technology Professor – Assistant Professor & More Recruitment 2018. Eligible candidates can apply Offline before 20-06-2018. Interested & Eligible candidates can send their application along with all the necessary documents and testimonials to Principal, Don Bosco Institute of Technology, Premier Automobiles Road, Opp. HDIL Premier Exotica, Kurla (w), Mumbai, Maharashtra 400070. Starting Date, Last Date to Apply Offline at Don Bosco Institute of Technology Mumbai which candidates should be remembers as follows. Start Date to Apply Offline: 06-06-2018. Last Date to Apply Offline: 20-06-2018.